The other day my wife attended a class where one of our priests mentioned that we offer prayers for the departed up to the 40th or 41st day with incense because we are honouring the bread and wine they would have accepted which would be live for around 40 days as per human physiology. I do not know whether this is correct because even after the 40th day, for the subsequent anniversaries we offer incense prayers. What I feel is that offering incense is our tradition we have from the OT days as we read about Aaron and others offering incense during prayers. The visions of Isaiah and John describes such prayers taking place in Heaven.Therefore, incense offering looks like an accompaniment to all our prayers. Thinking at a higher level, it may prepare us or help us to worship God in all His Omnipotence beyond time and space restrictions. The second point is based on heated argument I had with my wife ( not a quarrel, but quite positive ) on using Nilavilakku while praying. She was a Marthomite having accepted each and everything in Orthodox Church in true spirits and living like a true Orthodox in all respects. Here, what she feels is that we are accepting some Hindu systems, which according to her is wrong. I tried to convince her that this is not Hindu, but Indian in essence. Also, OT tradition too allows this. Jews do the same. She takes a stand that this would have come up due to non invention of electricity during OT era. But now it is a pure Hindu custom and we should not do this. I took the stand that we should see it as our accepting Indian culture and that this should be seen as light, a symbolic representation of ourselves aiming to be light of the world. I also told her that singing hymns like CSI people just imitate English custom and we should be able to switch over to India style of singing, by suitable changes in our Syriac ragas. The thali too is Indian and not Hindu because there are certain Hindu sects who are not using thali for marriages. Thank you for the mail. I am in California and enjoying the company of our people in this part of the country. Regarding the question, in both cases you are right. First, I have never heard this interesting explanation about dhoopam. Basically the 40 days observance of the bereavement of the departed is a cultural thing. In most of the ancient cultures people remember the departed with special acts and functions for a prescribed date. 40 days is not observed in all parts of our Church. In Kunnamkulam area people do it some times for 6 days, some times for 3 days. But there is an importance given to 40 days as this custom is seen in most of the traditions. We relate it with the days of Jesus in this world after his resurrection. Regarding dhoopam you are right, it is practiced in almost all religions of the world. In our Church, it symbolizes our prayers that go up with the dhoopam which shall be pleasing to God. Again it also symbolizes the sanctification of the community. It has a medicinal effect also. Who ever might have said that the Holy Qurbana and the bread and wine has effect only for 40 days, knows nothing about the Holy Qurbana. It has eternal effect. This is what Jesus told his disciples. He said, “Who ever eats of this bread shall live for ever” (John 6:50. There are other passages too with the same meaning). Lighting the lamp is also seen in all cultures and therefore in almost all religion religions. It is some thing universal. It provides light of course, but then in almost all religions light is related to the divine. Jesus talked about himself as light at the lamp stand of the Jerusalem temple (John 8:12; 9:5; 12: 46 etc.). In Jerusalem temple they had oil lamps like that we have now in our Churches with seven branches. The medium you use for lighting the lamp is subject to availability and culture. In the Mediterranean world they use similar lamps with olive oil. In the western world they use candles made of wax as the medium. What we call Hinduism is a mixture of several religions. It was the British who created that word as they did not know what our religious heritage was in India. There are people in Hinduism who use different kind of lamps in worship. Nilavilakku is used predominantly in Kerala and Kerala was not a Hindu country in its strict sense. It was rather a dravidian region. The shape of the lamp has no relation to any religion. Again Thali is also not used in all parts of India among those who practice ‘Hinduism’. You can not call any of these practices as Indian too. Because our country is a big one and the customs and cultures are variant. Many of the practices are local. Religion can only be practiced in a given context adapting the customs of the local culture. There is nothing wrong in it if you believe that God is one and universal. He works among people in line with their living environment. It will be wrong on the part of any one when they say that one particular religious practice is just for one religion. As long as we say that our God is the only God and is the creator of every thing seen and unseen, we have all right to use the cultural elements of a locality in our worship. There is, as a matter of fact, nothing called a Hindu culture. There are Dravidian culture, Aryan culture, Persian culture, Buddhist culture and so on which all existed side by side and many time overlapped and joined together in the present Indian sub-continent. The British were not so intelligent to identify all these, also they wanted to control the people easily. So they called it Hindu. The present RSS and BJP leaders also follow the suit as it fits in with their political agenda. There is no Sivalingam on the top of the Nilavilakku. It is only a practical piece to pour oil in to the lamp without spilling. Nilavilakku originated in Kerala not as a religious symbol rather, as the name suggests, a lamp that sits on the ground. Of course it may have, like in the case of many other things, got religious interpretation later in history. This is one among them. Many of the so-called Christian practices and cultural elements are adaptation from various cultures. Vilakku in any shape or form only symbolizes light and therefore learning and wisdom, Earlier we used candles in our Churches and we developed a 'theology of candle'. In the beginning it was just a source of light in caves where Christians used to worship for fear of kings and authorities. But now we use electric bulbs in the shape of candles. Have you thought of the theology behind that? There is nothing Christian about symbols. When we give Christian meaning to an existing symbol, it becomes Christian. Initially Christians did not use cross as a Christian symbol, rather used FISH (IXTUS) as the Christian symbol. Cross was began to be used only on a Royal decree of King Constantine. I think you must have a serious study on history of religions and religious symbols.. I have heard a similar explanation of nilavilakku and was looking online about it. Along with your post, I found another weblink. A quote from there is here: "The lamp denotes the Hindu trinity of Brahma/Vishnu/Shiva. The base represents Brahma, the stem represents Vishnu, the head represents Shiva, the wicks represent Parvathi and the heat represents Lakshmi. This is the meaning of the Hindu lamp. The Hindu lamp is so beautiful in concept and design." I realize that nilavilakku is not a part of our worship. Indeed we use it with a cross on top, which I think can be explained as good or bad. I remember hearing a native american pastor saying that through Christ the cultures are blessed, and hence the practices that they had for years and years do not need to be changed (if they do not contradict the Bible). In other words, the face of Christianity is not Western, but global. In a similar way, we have inherited different cultural values and practices. That being said, my question is about using the nilavilakku (without a cross) on Christian functions/prayers etc. Even though it represent light, isn't the religious meaning that it has, before we adapted it, an issue? I am thinking this along with Deut 12:31, "You must not worship the Lord your God in their way, because in worshiping their gods, they do all kinds of detestable things the Lord hates. They even burn their sons and daughters in the fire as sacrifices to their gods." Of course Christ is universal and any thing that can represent Him should not be considered as alien to Christians. Israel, when they came to Canaan, had similar situation. What they did was adapted the cultural elements in Canaan, but reinterpreted the meaning of each in such a way it represented their faith. Here I would make a small addition to what you read from this native American pastor to this effect. We can adapt any thing from other cultures, but need to give a new meaning to the elements in it. This happens in other religions too. When we adapted the 'thali' for women in marriage, we put a cross on it. We have now classical music and dance from Indian local cultures, but with Christian themes. Taking the question of 'nilavilakku' it has been there in Kerala culture (also in Tamil Nadu) and therefore it can not be originally an Aryan symbol. Hence the interpretation given by this website can not be original interpretation. You do not see this lamp in North India where Aryans came first. Possibility is that, when they came to the Dravidian land and saw this lamp they gave it their interpretation. Similarly, we can use it giving a different interpretation. It will be good if you have a cross on the top, but even if it does not have one, still it can represent Christ who is the light of the world. My interpretation would be the base is the world and creation and the stem above the base that leads to where the light is, is the passage through which you can reach the light who is Christ Himself and through whom we shall reach God the Father which is represented by the stem over the light that ends in free space as Jesus said, "no one can reach the father except through me". If we start from the top, we have the Father who is otherwise incomprehensible (with its top in the air) came down to in incarnation and that is the Light of the world, who reached out to us who are on the base or in this world. A similar interpretation was given even to the Cross which was originally a gallows, for Christians became symbol of salvation. At this juncture I should quote an interpretation given by Nitya Chaithanya Yathi of Fern Hill who said, "cross is made of two pieces of wood, one vertical representing relation between God and human and another horizontal that represents relation between human and human or creation and creation. How marvelous it is! This is how you take symbols from other cultures to make it meaningful to you. I am sorry, but Nilavilakku is of biblical origins. Zechariah 4:2 clearly mentions it, in the very same form it does have now. Thirumeni is absolutely right in his explanation about it. A nilavilakku is a symbol of Malayali culture - see that it is not used elsewhere. The lamp thatNazranees use exactly resembles the one in Zechariah 4:2, with 7 wicks. 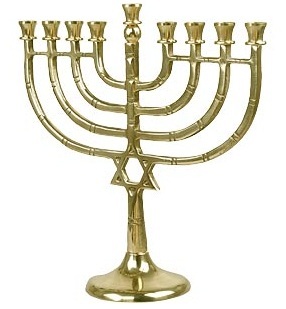 The 7 wicked lamp also used in Judaism. In fact Hinduism in kerala is unique and different from what we see elsewhere, only because of the Hebrew/Christian influence it has.